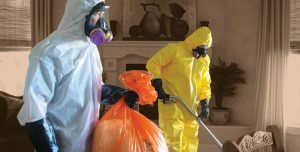 After a major house fire, until the home is professionally cleaned to remove any smoke damage the house will not be able to return to its original condition. We recommend that the homeowner should not try to clean the smoke damage themselves, fire restoration is a fairly simple concept but it requires a lot of labor and experience to thoroughly clean the house. One of the major concern after a home fire is the ash and smoke that is left behind. If left untreated, the ash and smoke can cause extensive corrosion, etching, and discoloration. First, ash will lead to the discoloration of most surfaces. Depending on the material, discoloration can happen within a few minutes. For fiberglass or finishes on household appliances, within a few hours, you will be able to notice a change in color too. After a few days, the ash will cause walls to discolor permanently. It is vital that a professional is brought in to fix any home damage caused by fire immediately. The cost for fire restoration will only increase the longer the damage is left untreated. Due to the acidic nature of ash, the longer it sits, the more damage it will cause. This includes a strong odor that may be difficult to get rid of. What Will a Professional Do? Upon hiring a professional, they will take note of any areas that have been affected the most and where the odor is the most pungent. The professional will make a decision on what can be salvaged and what should be removed. A specialized detergent may be used to remove any remaining odor left in the home.